The Freedom of the Will set to RELEASE Feb. 11th. RHB’s line of SDG titles are being one by one reprinted for those who loved great work. This one however is going to be released in the next month! Also if you would like a PDF of their newest catalog, here ya go… Feb. 2009 Tolle Lege. Many scholars believe this work, published in 1754, is the most important argument against Arminianism published in America. Freedom of the Will is divided into four parts. The first deals with terminology; the nature and determi- nation of the will; the meaning of necessity, impossibility, and contingency; the distinction between natural and moral necessity; and the nature of moral agency and liberty. The second considers the possibility of self-determination. The third analyzes divine agency regarding human beings and the world. In the conclusion, Edwards anticipates the recep- tion the work will receive. Noteworthy is Edwards’s essential agreement with the empiricist John Locke that the question of whether or not the will was “free” was badly posed; the real issue, he said, is whether the person is free. The majority of the work, however, deals with the will’s freedom (in contrast to the freedom of the whole person) as it seeks to refute the Arminian notion of the will. For Edwards, the errors of the Arminians essentially resulted from denying God’s absolute sovereignty; in contrast to Calvinist orthodoxy, Arminians insisted that secondary causes could operate in the individual apart from the influence of the divine will. 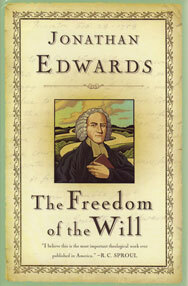 This notion of the will’s freedom had Pelagian roots, which Edwards rightly exposed. Furthermore, the refusal of the Arminians to acknowledge the individual’s total corrup- tion promoted further error. The will cannot be free as the Arminians would have it, Edwards argued, for true free- dom can only belong to God, who is self-sustaining and therefore free from other influences.